For those with PovRay experience this has many advantages. PovRay is a highly scriptable and automated environment which often can compensate for the lack of a graphical user interface. PovRay can run on "big" machines (license free) and thus one can render animations on hundreds of nodes (potentially) simultaneously. PovRay can handle huge mesh datasets, of a size that would adversely affect the interactive performance of other rendering/animation packages. 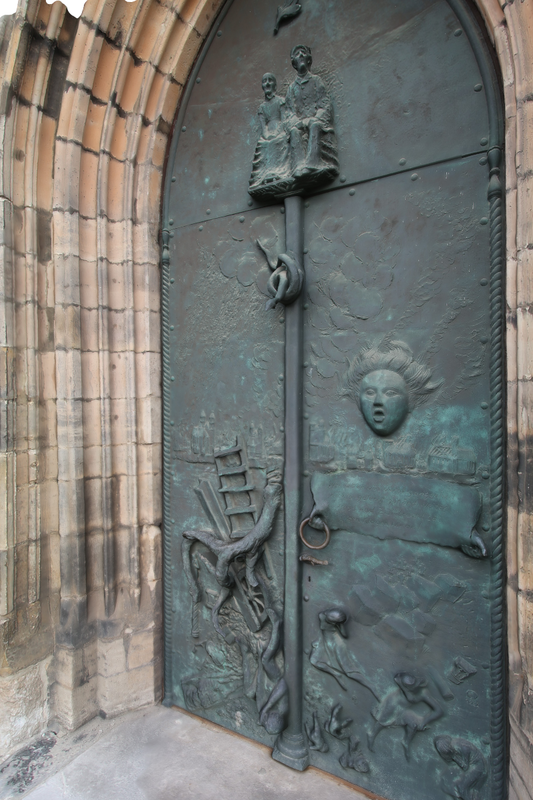 The work flow presented here will be illustrated with a reconstruction of a door from a cathedral in Magdeburg, Germany. The details of the reconstruction will not be covered here except to say the photoset consists of about 60 photographs taken with a 24 MPixel camera. 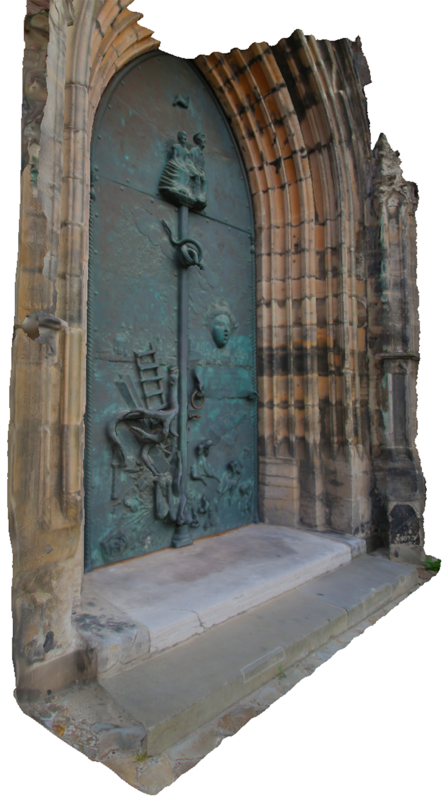 Some of the gaps behind the geometry have not been successfully reconstructed due to limitation of access to the receded door way. The model is exported as an OBJ (WaveFront) with just 1 million triangles and comprising of four 4Kx4K texture maps. The key to this process is a utility developed called simply "obj2pov". It takes a single command line argument (UNIX style utility) that is the OBJ file, the names of the output files for PovRay are internally generated. It should be pointed out that this is by no means a general OBJ converter, rather it handles the OBJ export from the reconstruction packages encountered and tested so far. Running the utility generates screen output as follows. The 4 materials correspond to the 4 textures the reconstruction was generated with. For those familiar with OBJ files it should be noted that it was not necessary to parse the material (.mtl) or the image files themselves, this connection can be made later in the PovRay scene file. The files making up this project are listed below. The first 6 are the exported OBJ files, the surf?.inc are the 4 mesh files (one per texture) created for PovRay, and the two last files are the scene files for the rendering. This whole package can be downloaded here: archive.zip. This is not a PovRay tutorial and as such only those aspects relevant to this work flow will be explained. Version 3.7 of PovRay is used, the latest at the time of writing but more importantly the first parallel implementation that does image space splitting across available cores, a key for high rendering speeds especially on typically high core count HPC facilities. The .ini file shown below is nothing special, it implements supersampling antialiasing, sets the image size and in this case a 300 frame animation will be created. As per usual PovRay animations the clock variable will be used to control the camera, the frame count being a convenient way to create preview movies before longer smoother movies. The "Output_Alpha" can be turned on to provide frames with the (empty) background transparent, this is often useful for compositing. The first requirement is to link the textures to the materials in the OBJ file. The converter creates meshes (surf*.inc files) with textures called "texture0", "texture1" etc. Each of these needs to be defined in terms of the texture "image_maps". For this example no lighting model will be used so the finish is set to pure ambient. Also for the purposes of this exercise the light source will be placed at the camera location. The surf?.inc files created by the converter look as follows, basically a "mesh2" primitive with uv textures. The mesh is defined by vertices, (u,v) textures coordinates, followed by face and uv indices. These are simple format mappings from the OBJ data. Note that useful definitions such as the overall size (RANGE) and center of the model are included, in this example it is used to center the model at the origin. Often models from 3D reconstruction are not positioned, scaled, or orientated. Remedying this in the most general case will be discussed next. The center and scale allow for two corrections, the orientation is corrected in PovRay by importing the model as shown below. Note that if the orientation can be performed in the reconstruction phase then these additional rotations are not required. The coordinate system used here is the authors choice, right handed, "z" upwards ... others options are obviously possible. All that remains is to render the model with the desired camera settings and animation path. The following is the command line and a preview showing the axes that were used to check the axes alignment. 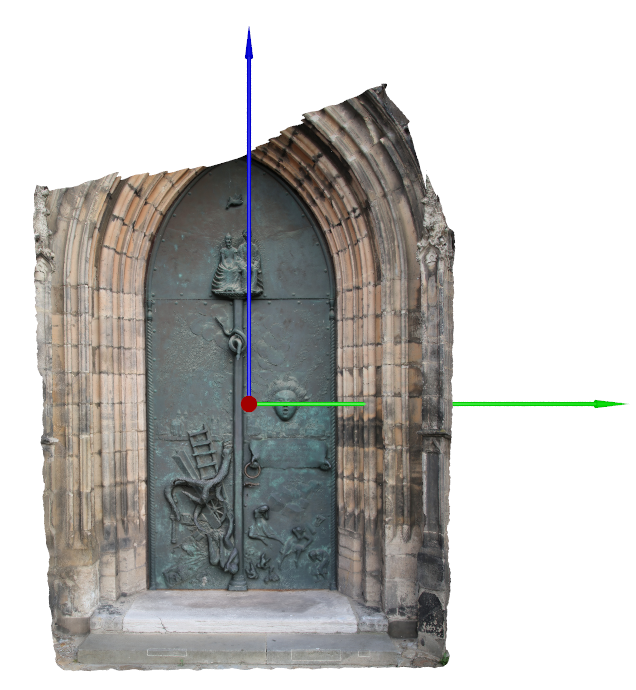 Figure 2: Resulting image in PovRay with axes visible, camera 1 unit away. The following is a zoomed in view of the first frame of a simple rotation animation from -30 degrees to +30 degrees. The movie can be viewed or downloaded here: sample.mov.